Claytex is a consultancy, developer and provider of systems engineering tools. We focus on the use of modelling and simulation leveraging the open standards of Modelica and FMI and develop application libraries and tools using these standards. As distributors for both Dassault Systemes and rFpro we can provide a comprehensive suite of solutions for Automotive and Motorsport customers enabling all aspects of a vehicle (mechanical, electrical, thermal, cooling, and control) to be modelled, simulated, analysed and tested in a virtual environment. These solutions include support for testing ADAS and autonomous vehicles using immersive virtual test environments that allow the vehicle model, it’s sensors and control systems to be fully immersed into a virtual world. In addition, the range of products from Dassault Systemes covers many other industries including Aerospace, Buildings and Industrial Equipment. Reqtify has developed within the Aerospace industry to automate the tracing of requirements across the design and development process. It is now applied in many other sectors including Rail and Automotive. 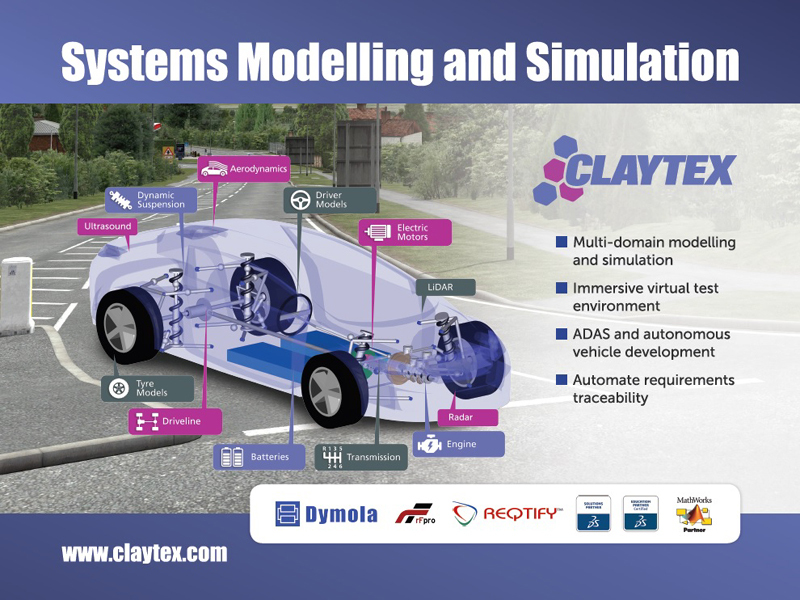 As a consultancy, Claytex works with our customers to create CAE models, tools and processes to help develop their products using a systems engineering approach. We create models that help you understand the interaction between the parts and help optimize the overall system performance and behaviour.